Are you searching for ways to supplement your budget? Dawn will share tips for writing successful projects and funding the materials you need for your classroom, library, makerspace, and students. Dawn is an expert in crowdfunding through the DonorsChoose charity website. Not only is she a volunteer screener, but she has also funded over 150 projects for books, technology devices, consumables, and even a field trip to the New York Hall of Science! A lucky workshop participant will win a $25 DonorsChoose gift card from the Gift of Learning DonorsChoose Community! Drones are used in so many careers such as aerial photography, mapping, and even the military. 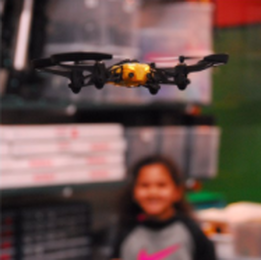 Come learn how drones can be used safely to teach students coding with Tynker, problem-solving, spatial skills, and teamwork. Todd will demonstrate and share a variety of lessons and tools to have you and your students learning and flying in no time! ​Building off a fine arts background, Anita will focus this session on the social maker philosophy. Topics will included how it fits into the maker movement, how it has been a vehicle for social change in the community, and how STEAM/STEM can be integrated with student interest and student driven change. Examples will be demonstrated and participants will leave with a social maker plan. "Touching the Future with TouchCast"
Become a member at http://www.longislandleads.org.